There are a few feelings that can't be beat. It might be sunshine on a powder day, first coffee of the morning, stomping that elusive trick or even something as simple as an onsen after a hard day of deep turns. Whatever it is, it has to be personal, based on something meaningful to you. Like walking into your school and telling your boss that you're quitting to move to Niseko. Now that's a feeling that takes some beating. Looking at your boss and saying, "I'm off!" With just a hint of a smile, saying that you can no longer work for "Crappy Eikaiwa" anymore because you have to move to Niseko for the season and ski powder. How easy is it to get a job? Not hard. There are different types of gaijin here, from those who have been here for years and are considered locals to those who arrive at the end of November and go knocking on pension - owners doors, looking for a job and a bed. Even if you end up with a shoebox for a room, fresh tracks everyday keeps the complaints away. There are pension jobs that give you a bed and a lift pass but make you work during breakfast - fresh tracks peak hour. There are jobs that allow you loads of time, but you have to buy your own lift pass - 87,000 yen, there are all kinds of jobs if you're prepared to get off your backside and look for them. I came to Niseko because my holiday in Whistler fell through, a blessing in disguise. Two days into my two-week stay, I decided that I had to do a season in Niseko. After lots of enquiries, questions and generally making a nuisance of myself, I was told to come back in March and start knocking on doors. Pensions are reluctant to offer jobs to people on the phone, or via email, due to the fact that they are often inviting you into their homes for the season and need to see that honest smile, hard working demeanor and fumbled "onegaishimasu". I was lucky and now work as an office manager for a tour operator, taking care of bookings, meeting guests, but most importantly, skiing powder. Skiing powder. Not riding powder, but skiing powder. Two days ago I took the gondola with a local Japanese skier. He was bursting with enthusiasm because I was a skier. This week I have been skiing with the local gaijin lads, mainly Australians, all of whom live and work in Niseko and board. Skiing with boarders used to be slow, waiting for people to strap in and adjust their bindings, but not here in Niseko. At the back of everyone's mind are those simple words - "powder has no mates". In the line for first gondola, with forty centimeters of powder heaven waiting above, " Oh no I forgot my lift pass - wait for me here!" is not something you hear. The lift has gone and the boarders are clicking in, not even stopping, their thoughts only on the turns below. A few days ago, I got up for first lifts and let them carry me up to the powder. I slipped under a rope and found myself alone at the top of an untouched run. I was the first one to reach it, white and deep. In an hour it would be criss-crossed with tracks from boarders and skiers, those who dipped under the ropes to work the powder, but for just a short time, it was mine. At the bottom, I looked back and saw my line slicing across the slope, before the local gaijin came arcing into view followed by clear, crisp catcalls. Tomorrow, that same run opens to the public, groomed into corduroy and we'll go looking for powder elsewhere, in amongst the trees, when the last of the sasa has been pressed from view. Today was epic. We got up, went to Centre-Four and took the lift to the thermometer - minus 12 degrees. The snow was deep and swirling, we could barely see the run beneath us, then down past 6C to the gondola. A rat pack of Japanese snowboarders weaved down the slope past us and on to the groomed run. 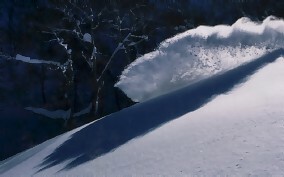 Shaking our heads, we ducked beneath a rope and ploughed into thigh deep powder, Niseko's first big offering this season. Face shots of snow filled my nostrils, yesterday's rocks were today's hits, not knowing if you were getting air or just floating. Looking over my shoulder, I could see the lads, bumping and bouncing over hits, between rocks, descending like Luftwaffe bombers, down to the flat below. First one there makes a track out for the rest to follow. 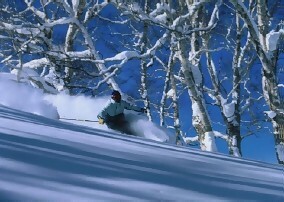 Two and a half hours of powder hits , turns, stacks and leg burning runs is a morning with the local gaijin in Niseko. Being a gaijin skier in Niseko is rare. In the gondola, nobody talks about AK Launchers as opposed to Bandit triple X's. None of the gaijin are talking about the latest signature twin tips, or Pocket Rockets, or Candide's latest gravity defying trick. Skiing is not the popular thing to do amongst the gaijin population of Niseko, but for me, it is heaven. I first set eyes on a ski resort when I came to live in Hiroshima, four and a half years ago. 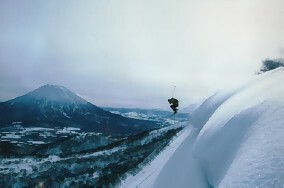 I first skied powder in Niseko last Christmas. Like an addict, I had to ski more powder so I moved here, possible if you're determined enough. I'm not a great skier but I won't get any better teaching "How are you?" to thirty sleepy junior high school kids. "Thank god I didn't go to Whistler!"